This Radio Mil AM Estereo is not an easy catch because of the powerful North American stations on the same frequency. In October 1995 KOMO was the dominant here, but fortunately XEOY was audible and occasionally on top for about 20 minutes. Getting program details from this and many other capital stations is relatively easy, as they have so many public service announcements. XEOY belongs to N�cleo Radio Mil. My verification from 1996 was signed by Lic. E. Guillermo Salas. Nowadays XEOY has a website (which seems to have been a must for DF stations since 1999). Originally the site was painstakingly slow to download, thanks to the excessive use of graphics. And they haven't learned; in 2002 the site was complete with a Flash introduction, which made it even slower. La Poderosa X is a powerful 50-kilowatt station in Mexico's second-biggest market area. XEHL is trying to stay alive by promoting huge popular events and by playing popular grupera. Again a station, which is relatively frequent in logs, but tough to get a verification from. For a QSL, your best shot is to try the e-mail address of their sister station operating on FM: kebuena971@hotmail.com. In 1993 when I heard XEMPM for the first time, they were broadcasting a baseball (b�isbol) match of their hometown team, which probably plays in the Liga Mexicana del Pac�fico. Aside from sports, they describe their format as M�sica de Grupos; la m�s escuchada m�sica popular grupera, cumbias y tecno banda. Like the rest of the stations belonging to Radiosistema del Noroeste, XEMPM doesn't seem to announce their call-letters too often � at least I never heard them � but fortunately the slogan Radio Fama is used every now and then. I knew I had caught something new when I heard the announcement Estereo Gaviota le desea fel�z navidad � already a month before Christmas. The station turned out to be XEBCC. I don't know if the AM is really stereo, they may be referring to FM 100.5, which is simulcast on AM. Jos� Guillermo Lliteras Escalante, or Billy for short, is the Gerente General of the station, and verified by e-mail in 1997. For a while XEBCC had a concise web page at www.bcc.com.mx, where they give two new e-mail addresses, bcc@acnet.net and lopezjob@acnet.net, the latter one for the management. In 2002 the website no longer functioned, but emails could still be valid, because they are under a different domain. La Ranchera de Monterrey is a powerful 100-kilowatt station, and is relatively easily heard in Lapland. As evidence of their worldwide audience, they even have a printed QSL-card, or at least used to have in 1990, when I received mine. Judging by the design, it dates back to the 1960's or 70's. XEG is known to be one of the most reliable verifiers. The slogan Radio Educaci�n says it all. The entire 20 minutes that I listened to the station in 1993 was talk programming, even though it was far from prime time. The station is fairly often audible on AM, but of course the easier way to catch this would be to listen to their shortwave transmitter XEPPM on 6185 kHz. 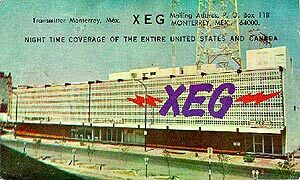 XEEP also has a QSL-card, with a much more modern design than XEG. Radio Express targets the Hispanic population of the southern part of the state of California, not Baja California. They have an address in Tijuana as well, but it seems that at least sales and programming departments are all in their L.A. office, which 10 years ago used to be located in Hollywood. The promotional material that I received was all in English, and I only heard advertisements for U.S. companies, but programming is of course in Spanish, and my verification letter was written in Spanish � a truly bilingual station. An endless stream of PSAs made reporting Radio Red easy, but not exactly a pleasure to listen to. Fortunately, XERED is a regular verifier. My QSL from 1995, both in the form of a letter and a card, was signed by Alicia Ibargüengoitia Gonz�lez (believe me, no spelling errors here...), Director de Operaci�n y Programaci�n. The La Comadre of 1995 has become Super Deportiva with sports programming. My QSL received in December 1999 (verie-signer Anibal C�rdoba Galarza, Gerente de Programaci�n y Producci�n Nacional) says they are on the air 24 hours a day, but the attached schedule only gave program details from 6 a.m. to 12 p.m. local time. Aside from the age-old street address of Pirineos 770 you can get in touch with the station through the Grupo ACIR website. XEWK began broadcasting in 1954 as a relay of the famous XEW, but switched to mainly local programming in 1977. Nowadays the share of local programming is said to be 84 %, but the station still belongs to Grupo Radi�polis. My verie-signer Felipe Silva Torres, Gerente de Producci�n & Programaci�n, says that Guadalajara is an exceptionally tough market for radio stations: there are nearly 50 radio stations, the same number as in Mexico City, but the potential audience is only one fifth of the capital. 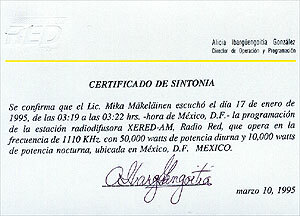 In this competition La W de Guadalajara has performed well, being number two of the AM stations in 1995, when I received the QSL (along with a t-shirt etc). They run mostly talk programming (I received many cassettes with recordings of their programs) with a crew of about 100, 60 of which are freelancers. To get a taste of their style, listen to an excerpt of the special greetings sent to me on tape.